how about considering whether to try to find one? and want to find a new one – we hope that we can help. and want to book online? – that is why we are here. your bed and breakfast stay is our aim to facilitate. "We the undersigned petition the Prime Minister to act to ensure that the 2006 Fire Regulations ("RRFSO") are enforced proportionately and consistently without onerous burdens on very small premises not justified by the actual risk." "The Regulatory Reform (Fire Safety) Order 2005 (RRFSO), in force since October 2006, requires many tens of thousands of small home-based businesses to do a Fire Risk Assessment and put in "appropriate" fire precautions, bearing in mind the size of the undertaking. The way this is being enforced in practice by local fire authorities is inconsistent, and is frequently imposing onerous burdens, not justified by the actual risk, on very small premises (many of which are closing as a result, affecting tourism accommodation). We call on the Prime Minister to act to ensure that the proportionality intended by the RRFSO is delivered in practice in a "common sense" way as the RRFSO is enforced locally - thus ensuring that small home-based ventures are not threatened unnecessarily." The Government recognises the essential contribution which micro-, small- and medium-sized businesses make to the British economy. The Government is particularly aware of the need to support such firms, and to ensure that regulatory and other burdens are risk-based and proportionate, during the global downturn. To help responsible persons, particularly micro-, small- and medium-sized businesses, comply with their responsibilities, the Government produced detailed guidance on the risk assessment process. This is available (to purchase or download free) at www.communities.gov.uk/firesafety . The Government worked in partnership with industry representatives, including many of those involved in the Fire Safety Sense Campaign, as well as with the Fire and Rescue Service itself to produce an information booklet on the requirements of the Order specifically for this sector. The booklet explains the risk assessment process, sets out sources of further advice and guidance and offers some practical information for owners on what may represent appropriate and proportionate fire safety measures in these more domestic-style of premises. Of course, the booklet can only offer generic advice: no two premises are the same and as a result, there can be no 'one size fits all' approach to fire safety. The Government recognised that the Fire and Rescue Service may, in some instances, also welcome additional information and clarity on fire safety expectations in this type of premises. However the extent to which compliance is being delivered is a matter of professional judgement based on the specific circumstances of individual premises. The Government welcomes the Bed and Breakfast Association's recent endorsement of the booklet in the January 2009 edition of Bed and Breakfast News. Ruth Watson recently spoke to a large group of delegates at the Tourism West Midlands' annual conference. TV viewers will be familiar with Ruth as the star of Channel Five's 'The Hotel Inspector' where she can be seen in action - on a mission to transform the nation's worst accommodation, aiming to turn hostility into hospitality and swap empty beds for a 'No Vacancies' sign. Ruth has plenty of experience of the hospitality industry as well as a real passion for food. 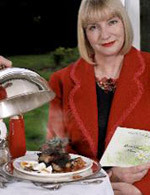 She is an award winning hotelier, restauranteur, cook, writer, and television presenter. Ruth currently owns the award winning Crown and Castle hotel, in the lovely village of Orford, on the Suffolk coast. During Ruth's opening remarks, she extolled the virtues of one of her favourite characters, Mrs. Doasyouwouldbedoneby (from Charles Kingsley's book, The Water Babies) . Ruth went onto remind delegates of the importance of giving good service by being welcoming and polite. Ruth believes that " 70% of the taste of the food is in the service. " Ruth stressed the importance of good marketing which she stressed, is not the same as advertising! She firmly believes that you can change your clientele by creative marketing. Contacting the local press is a good way of marketing your business positively, especially if you have introduced an innovative approach, such as becoming a 'green business'. Many businesses fail to attract bookings because their websites are not professional enough because, for example, large photographs make downloading pages slow. Ruth asked delegates to remember that guests' 'Total Experience' is based on perception and she implored listeners to remember that one should not try to be what you cannot be. Speaking about location, Ruth gave the example of her home in Suffolk which does not attract overseas visitors in the same way as Stratford-upon-Avon does. Therefore one's marketing in Suffolk would differ from that of a Stratford B&B owner. As Ruth concluded her presentation, she shared some of her personal experiences of being in the hospitality trade and said that others must remember that no matter how good you are, you will never meet everyone's expectations! Rick Stein is what one might describe as a very busy man as juggles with travelling abroad, filming, writing books and running his businesses in Cornwall. I have always enjoyed watching Rick’s TV programmes and I was delighted when he agreed to give Bed & Breakfast News an exclusive interview. Rick recently starred in one of BBC 2’s films remembering the life and work of Sir John Betjeman, who was, like Rick, passionate about Cornwall. “Betjeman and Me - Rick Stein's Story” included extracts of Betjeman’s poetry, glorious Cornish scenery and culminated in a seafood feast, cooked by Rick, for special guests including Sir John’s daughter Candida Lycett Green and one of Sir John’s best friends, Jonathan Steddall. The new Bed and Breakfast News website has been designed to be a source of information for new subscribers, advertisers and those in the industry wishing to submit editorial, it gives a flavour of the content of each monthly issue. The email links enable direct access to the B&B News news-desk. We welcome reciprocal website links with B&B and guesthouse associations nationwide and others within the industry. Advertisers are also welcome to link to our site. Please contact bedandbreakfastnews@yahoo.co.uk for details. Let us take the stress out of shopping! A subscription to B&B News makes a perfect present for a friend. For the price of one night's booking your gift will keep the recipient informed and entertained for a whole year !